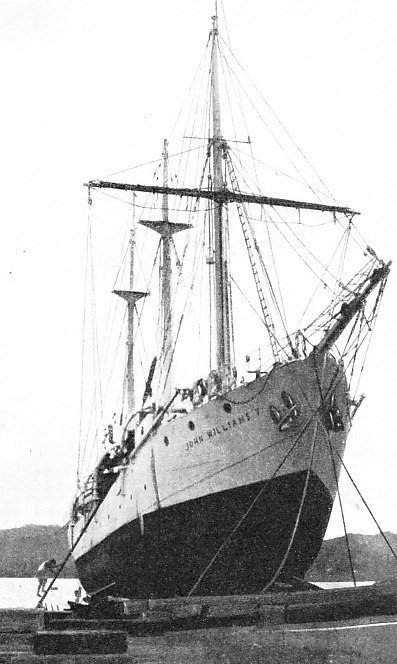 A WOODEN AUXILIARY BARQUENTINE of 393 tons, Thames measurement, the fourth Southern Cross, of the Melanesian Mission, was built in 1891 at Wivenhoe, Essex. She had a length of 131 feet, a beam of 26 ft 7-in and a depth of 14 ft 3-in. The Southern Cross did useful missionary work among the South Sea Islands. FOR a long period missionaries have been concerned with the sea. In the South Seas, especially, there have been many missionary ships of great interest and romantic history. The two most important bodies which have operated in the South Pacific are the London Missionary Society, which started its Pacific activities at Tahiti in 1797, and the Melanesian Mission. The Missionary Society began with a little vessel called the Duff, which was bought in 1796, and which sailed from the London River in that year. Having eluded French frigates and privateers, the Duff landed her people and returned to the Thames with a cargo of tea from China. For the transport of this tea the East India Company paid £4,100. On her second outward voyage, with more missionaries, she was captured by a French privateer, but the missionaries themselves were recaptured by a Portuguese force and returned to England. At a later date the London Missionary Society received an invaluable recruit in John Williams, who went out to the Society Islands in 1816 and proved a conspicuous success as a missionary. He made Raiatea his earliest headquarters, and worked from there for many years. At Eimeo he found an uncompleted ship which other missionaries had started for their work among the islands but had been unable to finish. By Williams’s activities this vessel was got ready for sea and christened the Haweis. Although small, she managed to do excellent work until she was presented to a native king as a matter of policy. 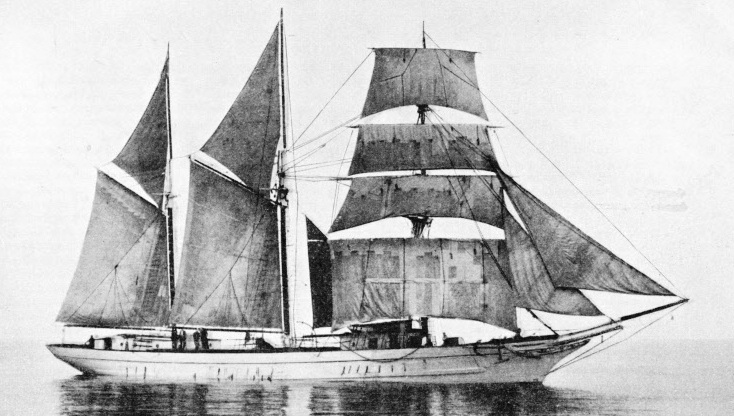 In Australia Williams bought an excellent little 90-tons typical South Sea schooner named the Endeavour, later rechristened Te Matamua, “The Beginning” in the native language. Williams was able to secure the respect and active help of some important native chiefs, who greatly assisted him in his work among the various islands before he finally settled down at Raratonga, in the Cook Islands. There he soon found the need of another ship for his work, and with extraordinary optimism set about building one himself. The island timber was none too good for ship purposes, and he had few tools or other necessities. He was, however, a man of extraordinary ingenuity, and he made the most of a ship’s chain cable which had been abandoned in a hurry in face of an attack by the cannibal natives. Working with charcoal instead of coal, and using a big stone as an anvil, he contrived to convert this into iron bolts and, improvising everything, he finally managed to build and launch the 60-feet Messenger of Peace. She was schooner rigged, with a straight stem and a well-shaped hull, but her rigging was curious. Her sails were made out of matting woven by the natives, her ropes were twisted from the fibres of the hibiscus tree, and her two masts from the natural wood were anything but straight and smooth A good deal of this primitive equipment and gear was replaced by proper material by the kindness of naval officers who appreciated Williams’s indomitable spirit although they were not always in sympathy with his missionary work. The Messenger of Peace was not exactly a satisfactory vessel for her purpose, but she made some remarkable voyages until, in 1833, after six years’ service, she was sold. For a time the work was carried on without any ship, but then the brig Camden, which had been a Government mail packet, was bought with the funds that had been raised by John Williams during a visit to England in 1838. She sailed in the same year, and was immediately put to good use, but when they called at Eromango, in the New Hebrides, the party was attacked by cannibals, and Williams and one of his companions were murdered. The Camden was an expensive ship to keep up, and her brig rig demanded a large crew. In 1843 she was sent home and sold. The Camden was replaced by the John Williams, the first ship to be paid for by the contributions of children in the English schools. Altogether £6,237 was raised, and she was specially designed and built at Harwich, Essex. She sailed in June 1844, a barque 103 feet in length. She was nearly wrecked on two occasions during her maiden voyage. Despite this, periodically returning to England for repairs, which were paid for by the enthusiastic children, she did excellent work until she was wrecked on Danger Island in May 1864. Two years later she was replaced by the second John Williams, also paid for by children’s subscriptions. She was a considerably bigger vessel, a barque of 296 tons gross, built by Hall, of Aberdeen, the famous clipper shipbuilder. In 1866, while still a new ship, she ran on a reef off Aneityum, in the New Hebrides. She was salved and repaired at Sydney, although she was not so lucky in January 1867, when she closed a short career by being wrecked on Savage Island. The Society had insured that vessel, and the money received from the underwriters permitted them to have the Samoa built by Hall. This vessel was a barque of 200 tons gross which had been designed for the Australian trade, and was renamed John Williams. She fulfilled the functions of the Society for many years until in 1895 she was sold to Australian owners, who renamed her Kashgar as a South Sea trader, but she was lost in the spring of 1896. Meanwhile the Society had a number of other vessels in the Pacific, some of them chartered and some of them bought and converted. These included the Surprise, the Ellengowan, which was a steamer, the Bertha, the schooner Ellengowan II, the former Government schooner Harrier and the fore-and-aft schooner Niue, which was presented to the Mission by the converts in the island of that name. In 1893 the fourth John Williams was built by Napier of Glasgow. She was a three-masted steel barquentine which spread about 12,500 square feet of canvas and she had a gross tonnage of 663. She was given a triple-expansion engine as an auxiliary, coupled with a Bevis feathering propeller which could be adjusted to offer the least resistance to the water when she was under sail. Six state-rooms gave comfortable accommodation for a dozen European missionaries, and she was commissioned under the command of Captain Turpie, who had been in command of the former John Williams. For many years she carried on her missionary work among the islands, steaming and sailing colossal distances and being based on Australia. Her officers were British, but her crew were island natives and fine seamen. She carried stores and reliefs to the various stations, landing them in her own boats where the station did not have a launch. Her people did an immense amount of missionary work, and on many occasions were able to give practical relief to dis-dressed islanders. In her later days her rig was reduced and she sailed with two pole masts, relying almost entirely on her engines. In 1930 she was sold to Angus and Company of Shanghai as a trader and soon afterwards re-sold to Chinese interests, who run her under the Chinese flag with the name Hsin Yi Li. She cost the Society much money to build, over £17,000, but it is doubtful whether they ever got a better bargain. BUILT AT ABERDEEN in 1868, the third John Williams, originally the Samoa, carried out the work of the London Missionary Society until the year 1895, when she was sold to Australian owners and renamed Kashgar. She was lost in April 1896. The present John Williams, the fifth of the name, was built by the Grangemouth Dockyard Company in 1930. She was an auxiliary three-masted schooner with Bermudian rig, and an auxiliary diesel engine of 150 horsepower. She cost roughly £18,000, £15,000 having been raised by the Congregational Churches in the British Isles and £3,000 in Australia and the South Sea Islands. Well equipped, she was given stowage for a certain amount of cargo, for part of the Society’s activities are educational and the young islanders pay their school fees in coco-nuts. The previous ship was rather large, and of too deep draught for some of the islands, and the present one is designed to be much more handy. Since she has been on service she has done excellent work. In addition to these ships on the South Sea Station the Missionary Society has had and still has a number of launches of various types and sizes, generally with native names. It has also had many ships on its other stations, ranging from the Calabash, which was a former slave dhow which had been captured, to a specially designed steel lifeboat which had to be put together on the shores of Lake Tanganyika. Connected with the London Missionary Society was the Active, which did much missionary work in the South Seas about the time of the end of the Napoleonic Wars. She was a good little ship for her purpose. The Melanesian ships are used for missionary work in the gigantic diocese of the Bishop of Melanesia. The fleet may claim to go back to the little Flying Fish, a schooner of only 17 tons register, which worked among the islands. When Bishop Selwyn went out as the first Bishop of New Zealand in 1841 he found the little Flying Fish too small for his purpose and, when there was no man-of-war available to give him the transport that he needed, used his own little schooner, the Undine, of 22 tons. In her he made a number of long cruises. She was replaced by the schooner Border Maid, of 91 tons, which was bought through the generosity of Australian contributors and worked for about three years. 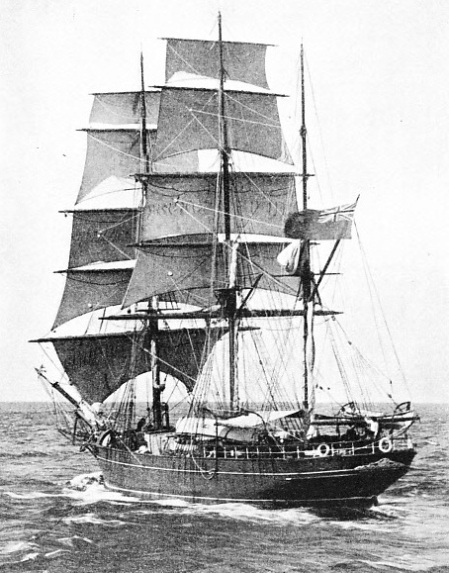 In the early ’fifties the diocese of Melanesia was separated from New Zealand and the 70-tons schooner Sea Breeze was chartered for its purposes. Then the Southern Cross mission ships were built. The name is as closely associated with the Melanesian Mission as that of John Williams is with the London Missionary Society. 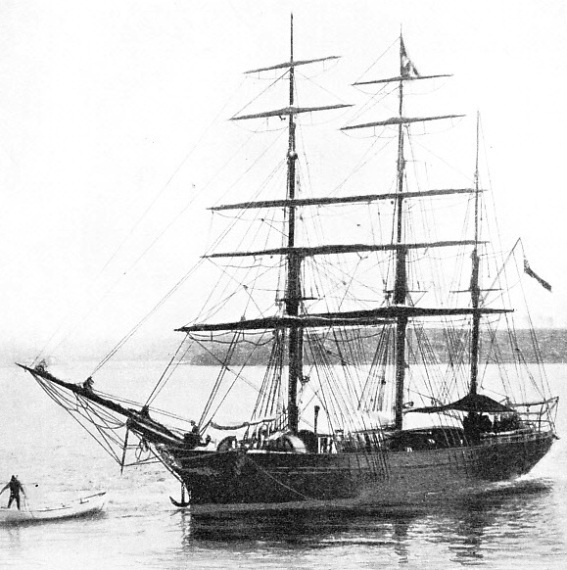 The first Southern Cross was a schooner bought from the trading service in 1855. She made a number of voyages from New Zealand to the islands before she was wrecked on the New Zealand coast. The second Southern Cross was a schooner of 92 tons register, which was built in England and arrived in New Zealand waters in 1863 under the command of Captain Tilly, who had formerly been master of HMS Cordelia on the New Zealand station. Although she was a queer-looking vessel whose lines aroused much criticism, yet as she made the voyage out from England in 108 days, with the delay of a call to replenish her water tanks, she cannot have been a bad ship for her type, and she certainly did excellent work as long as she lasted. IN SERVICE IN 1936, the fifth John Williams was built in 1930 and cost £18,000, most of which was raised by the Congregational Churches in the British Isles. With a length of 117 ft 6-in, a beam of 25 ft 1-in, and a depth of 8 ft 2-in, she was built as a steel auxiliary schooner of 227 tons gross. The third Southern Cross, built at Auckland, New Zealand, in 1874, was an auxiliary three-masted schooner of 205 tons Thames measurement, designed by Mr. J. Weymouth. Her builders, H. Niccol and Sons, were accustomed to turning out good healthy schooner hulls for work in the South Seas, but her single-cylinder steam engine was built by Auckland engineers who had little previous experience in marine work. It gave her a speed of about 4½ knots at her best, and was not of much use to her except to permit her to pick up or leave an anchorage during a calm. She cost £5,500, and New Zealand was always enthusiastic about her. In 1891 she was replaced by a fourth Southern Cross, a wooden auxiliary barquentine of 393 tons, Thames measurement, built by Forrest, of Wivenhoe, Essex, with a two-cylinder compound engine. She was one of the most beautiful little ships turned out by a firm well known for the grace of its productions, and her tonnage of 393 by Thames measurement was enough for her work among the islands. The fifth Southern Cross was built by Armstrong Whitworth and Company, of Newcastle-on-Tyne, in 1903, and was a steel three-masted schooner of 682 tons gross with triple-expansion auxiliary engines which gave a speed of over 10 knots. The auxiliary engines were never used unnecessarily, or pressed more than could be avoided, because of the long distances to be covered on the work of the diocese and because of the urgent necessity of conserving the coal supply. Capt. William Sinker was the schooner’s captain for many years. In 1927 she was cruising round the Solomon Islands at a time when there was a serious outbreak among the natives, and as she was not equipped with wireless the authorities were for a time concerned as to her safety. At that time she was at the end of her days, and her replacement, which had been considered for some time, was hurried by the fact that she was in serious trouble during a gale in 1929, losing her figurehead - always a sign of the worst of luck in the mind of any sailor - and sustaining much other damage. A new ship was ordered, but as her delivery was delayed the old Southern Cross was not sold until 1933, when she was bought to be broken up at Auckland, New Zealand. The next Southern Cross was built in 1932 by J. Samuel White and Company, of Cowes, and she was registered as a yacht. She was a twin-screw composite motor vessel of 220 tons Thames measurement on a length of 106 feet overall, a beam of 25 feet and a depth of hold of 11 ft 9 in. She had a straight stem, a long counter stern, two pole masts and one funnel, and did not at all fit in with the popular idea of a South Sea schooner. She looked a magnificent sea boat, however, and the absence of the more picturesque features was almost entirely due to the improvement of the more practical. In addition to accommodation for her crew, for missionaries, and for the Bishop when he was travelling, there was a special chapel built into the ship. She was capable of carrying 60 tons of cargo or stores, and her two internal-combustion engines, with a total horse-power of 240, gave a speed of about 9 knots. Before she went out to her station she was exhibited in London and attracted great attention. Unfortunately she was wrecked in the New Hebrides on the way out, driving ashore during a fierce storm, accompanied by blinding rain which prevented her people from seeing where they were. This disaster to a ship which had cost the Society over £21,000 was lightened by the magnificent gallantry exhibited by the officers on board. Mr. Scott, the first mate, in particular, distinguished himself by swimming through a heavy surf to shore and establishing communication by which his messmates were saved. DESIGNED FOR THE AUSTRALIAN TRADE, the third John Williams is here shown with sails furled. She was a barque of 200 tons gross, 106 feet long, 24 ft 6-in in beam and 13 ft 6-in deep. Later, as the Kashgar, she plied as a South Sea trader. The disaster created a deep impression in Great Britain, and it was not long before the Society was in a position to order a seventh Southern Cross, this time from Cammell Laird, of Birkenhead. Steel-built and slightly larger than the ship which had been lost, she was 110 feet long by 28 ft 6-in beam, and had two diesel engines totalling 240 horse-power. She was launched in the Continental fashion, with everything on board and almost ready to steam away to her station, and was built on the lines of a steam trawler. With her utilitarian straight stem, two pole masts and single funnel she does not resemble the picturesque South Sea schooners and barques which have preceded her. But she has proved herself an excellent vessel and mission ship.